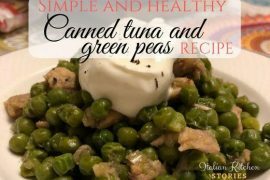 You can use veggies you already have at home (you don’t have to add all I have) … use green peas, celery, all bean types. You can make it different every time. 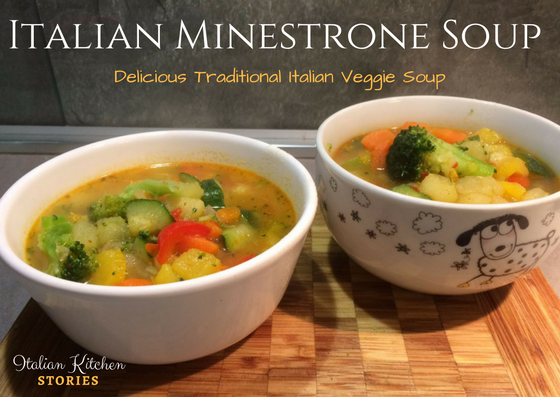 Follow easy 4 steps and make your first Italian minestrone soup! Wash, peal and chop all veggies. We like bigger chunks, but you can do as you prefer. If you are making it for kids, make the cubes a bit smaller. 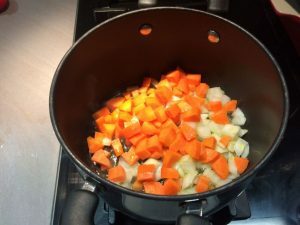 Pour olive oil into cooking pan and add the onions and carrots, stirring, until the onion is softened, 3 to 5 minutes. 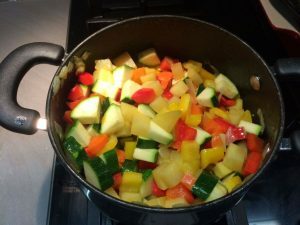 Then add vegetables according to their hardness: potatoes – peppers – zucchini – broccoli. I like to stir the every new veggie I put for about 2-3 minutes, before I add the new one. That will help absorb all the flavors and mix them together. Add vegetable broth (or water with veggie cube if you don’t have broth at hand). Cook for about 10 min on medium heat. 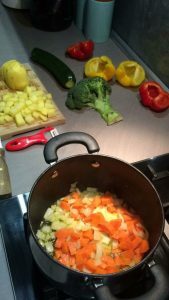 I add broccoli only 3 min before I finished cooking minestrone to avoid over cooking it. Serve warm. If you like to add more flavor add some fresh grated Parmesan cheese. 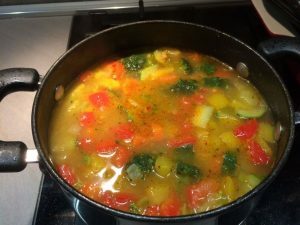 Enjoy this delicious vegetable soup!